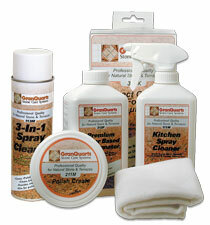 We recommend GranQuartz products for maintenance of your natural stone. Acidic substances like wine, coffee, fruit juices, tomato sauce and sodas will not etch granite, but they could potentially stain the surface if they are not immediately wiped up. Using a specially formulated stone cleaner is recommended to keep your tops in the best condition and protect the sealer, but hot water will do for quick clean ups. Dish soap will not hurt your granite but repeated or excessive use of soap will cause build up and dull your countertop's shine. Use trivets and hot pads under pots, pans and dinnerware. You can take a hot pot right off the stove and put it directly on granite, quartz or soapstone without any problems. However, once you remove the hot pan from the countertop the surface will get EXTREMELY HOT and may burn. Avoid the possibility of scratching the surface and protect your knives. Cutting on the stone will dull and damage your knives' edges quickly. Don't: Use generic cleaning products such as bleach, glass cleaners (Windex) or degreasers. These products that you buy at your local store contain acids, alkalis and other chemicals that can etch marble and degrade the granite sealer, leaving the stone more vulnerable to staining. Although the product may clean your countertop and leave it looking shiny, over time it may damage the surface or sealer. Don't: Use vinegar, ammonia, lemons or oranges as cleaners. DAILY: Hot water and a sponge are sufficient to wipe up spills and debris and keep your countertops clean and tidy throughout the day. At the end of the day, a quick spray and wipe of the most heavily used areas with a stone cleaner will adequately clean, disinfect and protect your countertops. QUARTERLY: Polishes can also be used periodically to add just a bit of extra shine for the ultimate in natural stone and granite countertop care.